Good girl Ivy Beckett has her life mapped out in a neat checklist: Graduate high school, study law at a top university, secure a lucrative career. So far everything’s going to plan, so why does her future leave her feeling vaguely nauseous? When an autumn storm sends the seventeen-year-old running for cover inside an old antique store, Ivy is transported to another world. A world that includes an eccentric shop owner and her enigmatic nephew Julian, a gifted artist. If Julian’s talent is to see beauty, Ivy was born to capture it in words, and her new friends trigger a wave of creative inspiration that leaves her heart humming like never before. Her parents, however, are not so enamoured. Ivy’s dreams are finally starting to crystallise, but she will be forced to make an impossible choice—between the past she’s always known, and a future that might only be an illusion. 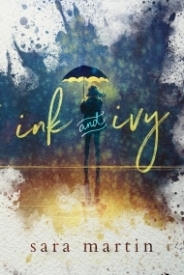 Ink & Ivy is a timely story about a girl struggling to figure out what to do with the rest of her life. As the story opens, Ivy is riding her bike when a downpour hits. She runs into a shop and meets an eccentric shop owner and her nephew Julian. Ivy’s picture of her perfect career soon begins to unravel and her dreams along with it. The cover got me on this one. Simply amazing! Ink & Ivy has a unique but important theme. Teenagers must often choose their careers while still in high school and they do not know themselves well enough to do so. The love of writing is described perfectly throughout the novel. I love how those close to Ivy (but outside her family) were so supportive of Ivy. Ivy’s slow burn romance with Julian was really sweet and a great teen love story. I love a good story within a story. I loved the whole dialog of Ivy’s English teacher being a mysterious author. This is the second book I’ve read in the last few months that takes place in New Zealand. It’s sounds enchanting and a great setting for a book. The elephant in the room in ‘Ink & Ivy’ is what jerks Ivy’s parent’s are to her. They didn’t support what Ivy wanted and tried forcing her into a career that she clearly did not want. They were even cruel and manipulative about it. Her father was much less of a jerk then her mother. It seemed that Ivy’s dad just did whatever his wife wanted but it would have been nice to see him stand up for himself and Ivy for once. This kind of parental attitude is all too common, unfortunately. My favorite part of the story is Ivy’s visit to her grandparents house. I loved the imagery of the lodge and the grounds. I loved Ivy’s grandparents and they were definitely a bright side to the story. I enjoyed Ivy’s story. The story didn’t have anything dramatic or earth shattering about it but it was a nice slice of life story. I am glad Ivy has a somewhat happy ending to her story. Although the story didn’t wrap everything up completely, it did give me a satisfactory ending. Ink and Ivy is a quiet contemporary which thoughtfully explores having the courage to become the person you were meant to be. When Ivy meets Julian unexpectedly in an antique store, she begins to see herself in a new light—quite different from the one her parents have always imagined for her. Martin tackles Ivy’s journey of self-exploration with a tender hand, to include careful plotting and all the emotions you’d expect in a character-driven narrative of this kind. The ending is satisfying, but I was honestly disappointed when it came to an end. I would definitely read a follow-up to this offering. Highly recommend for anyone looking for a well-written and uplifting coming of age narrative. Ink and Ivy is a quiet contemporary which thoughtfully explores having the courage to become the person you were meant to be.